Consumer Alert! Hire the Right Roof Cleaners! If your roof has green and black stuff growing on it, it’s not just ugly. It’s bad for the shingles. 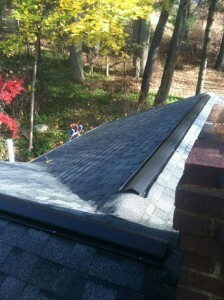 You can wind up with leaks in your attic and damage that means you need a new roof sooner rather than later. Lots of insurance companies have caught on to this, and they’re requiring clean roofs to keep your policy going. Here’s where it gets tricky though. Many supposed roof cleaning companies will take your money and then spread chemicals all over your roof that don’t do what they’re supposed to. At best the chemicals will temporarily kill the mold and algae, giving the appearance of a job well done, and then it’s back to square one as the moss and lichen spring back. Not only that, but then all the chemicals needs to be cleaned off of your garden, patios and lawn. It’s a total rip off. 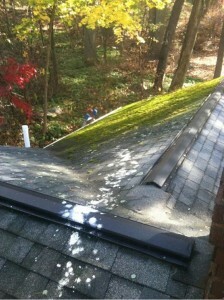 That’s why I recommend Roof Renew Pros. They only use organic cleaners which are safe for your pets, children and garden. They take their time and do a job so thorough that it’ll remove every speck of growth. Additionally, their technique uses very low pressure sprays so that you don’t have to worry about blasting your roof shingles loose or removing the granules that make them effective. High pressure sprays can actually void your warranty from shingle manufacturers! Your roof could last years longer with a good cleaning, but it has to be done right! And you don’t just have to take my word for it. The techniques that Roof Renew Pros use are actually endorsed by the roof shingle industry (including the Asphalt Roofing Manufacturers Association) as well as insurance companies. My customers consistently come back to me with rave reviews after I recommend this company. If you’re not satisfied, they stand by their work with a 100% Satisfaction Guarantee like the true professionals they are. 1. Prolong your shingle life. Moss, algae & lichen can grow into the narrow spaces between shingles, enlarging gaps & creating leaks! 2. Remove ugly roof stains. If any stains grow back within 2 years, Roof Renew will re-clean the area for free – guaranteed! 3. Lower utility bills! Dark stains attract more sun, which means that your home gets hotter than it should. 4. Increase property & resale value. A house that looks well kept fetches more money! 5. Avoid termination of your Homeowners Insurance policy. Many companies are insisting that roofs stay clear of organic growth. 6. Organic cleaning is safer. Keep chemicals out of your garden and away from where your kids and pets play. 7. Cleaning is cheaper than a new roof. An ounce of prevention is worth a pound of cure. Protect your investment. 8. Improve curb appeal. Why have a beautiful house with a splotchy roof? Complete the curb appeal! 9. Prevent black mold. Mold that develops on your roof can work its way into your attic. Keep your home healthy from the outside in. 10. Preserve your roof by never power washing. High pressure sprays will remove the gritty granules that protect your shingles! The Roof Renew Pros don’t just do roofs, either. If your siding, solar panels, decks or walkways have lost their fresh new look, Roof Renew can work miracles on them as well! Check out the before and after pictures on their website.